These summer holidays in Perth have fostered a kind of existential hopelessness. Firstly, when I hear at beach that the sunscreen we have been so well-trained to slap onto our family’s skin is poisoning the coral reefs it creates a paralysing moral choice between melanoma and marine ecosystem destruction? Secondly, I keep finding myself unconsciously checking WhatsApp on my smart phone. Which is like stumbling across my self-control parked up on blocks at the end of an empty cul-de-sac when I thought it was safe at home in the driveway. Finally, I’m deeply shocked to witness our seemingly well-adjusted children recruit their grandparents with the ruthless sophistication of Pablo Escobar to become compliant icy pole mules. 1. Could our very day-to-day existence be incompatible with the rest of life on Earth? 2. And is modern life really just an endless pursuit of sugar and screen-based highs? I drive past a shopping mall during the Boxing Day sales and things threaten to spiral into a full-blown crisis of self. It takes Curtis Stone spruiking BBQ chickens over the car radio to shake me out of my introspective funk. The image of a shed-full of anaemic industrial fowl destined for supermarket rotisseries acts like smelling salts for my distracted soul. 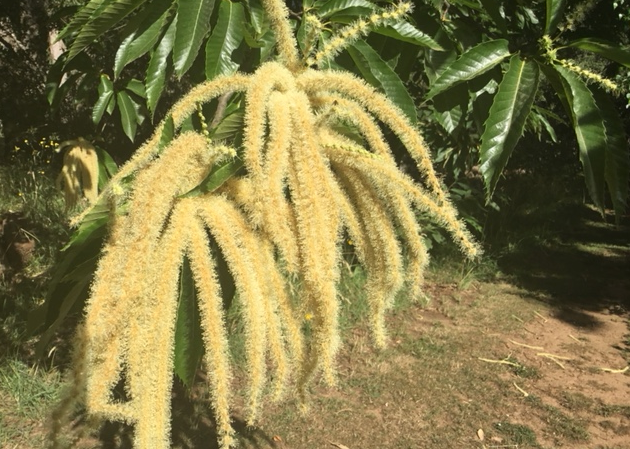 The next day Jenny Indian sends me the picture above of her flowering chestnut orchard up in Stanley and I’m reminded nature waits for no man to indulge in navel gazing. Not long after Jason Alexandra messages; the first plums at Hazeldean Farm are ready to send to town and I think of the old Zen saying – Summer 2018: speaking to Jason and selling plums. Summer 2019: speaking to Jason and selling plums. I need reminders like this, especially during unstructured free time. Reminders that the big things facing us don’t change in a hurry, that we really have to stick at it and mostly that we can only succeed if we do it together.